My name is Anne. My husband Art and I are the owners of some awesome pups. Please take a minute to check out their personal pages. We have chosen some very nice Yorkies to share our lives with and we love each one. They are part of our family and live in our home here in New Hampshire. We love them so much and are happy to make changes in our lives to accommodate them.We plan to have a few litters each year. ​​Click on "More" to meet my dogs! WE DO NOT CUT THE TAILS OFF OF OUR PUPPIES!!!! We focus on Quality and not Quantity!! We do not just pump out puppies here. We have worked hard to create lines that are healthy, sturdy, and gorgeous! We do not have puppies available all of the time, but our puppies are worth waiting for!!! ​Our next litters will be due sometime this Fall!! where I post pictures, information, updates, and more!! We Have Done Genetic Testing on Our Dogs to be Certain You Receive as Healthy a Puppy as we can Possibly Provide!!! Please check out our "Genetic Testing" Page for more information about what our dogs are tested for!!! FYI: We do NOT DOCK our puppies' tails. 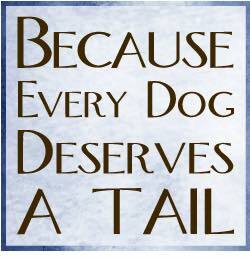 Our puppies come with their beautiful, expressive tails wagging behind them. 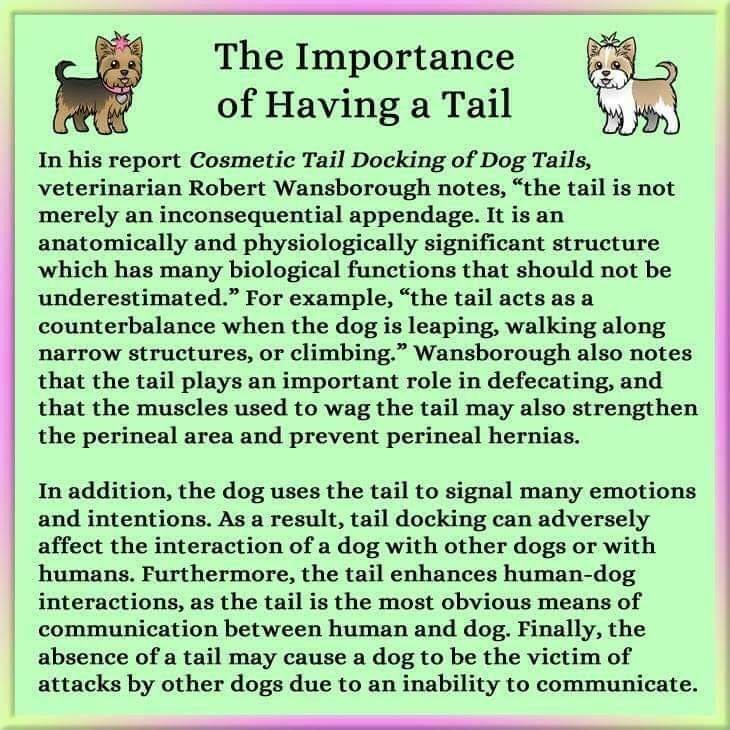 "We Love Our Puppy Tails" page. It is always a mix of emotions when we send one of our puppies home with a new family. We love seeing the love and excitement on the new family members faces, and at the same time we are feeling sad that one of our puppies that we raised and cared for is leaving us. ​Looking at this boy's face, the huge smile, and the love in his eyes, is the reason we raise our yorkies. We are doing a great service for our customers caring for and loving these pups and making sure to the best of our ability that each family takes home a healthy and well adjusted puppy. We are very careful to make sure our pups are going to a home where he/she will be loved and become a member of a family. The first step is our puppy application so if you are interested in one of our puppies please contact us and we will get the application right out to you. I thought I would share how and where my puppies are being raised and the 3 stages of whelping boxes/pens they go through! ​When the puppies have outgrown the stage 1 whelping box they move to the bigger wooden box. (I designed these and my husband made them) This gives them more room to move around and use their legs and get used to more room. 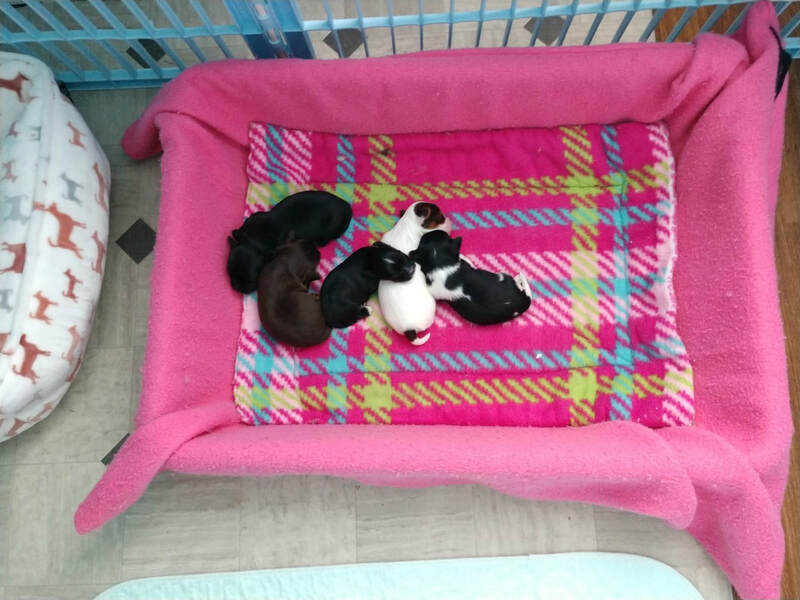 They start getting off their cushion to pee on the puppy pad at this time. They still need a secure feeling area and I prefer they have this middle stage before having them in the more open pen. They will eventually start trying to get over the side. When they start getting over the lower side of the box I take the box away and they are in the last stage 3. ​​This stage is when they are in the large pen and can really move around and play. They start eating food and drinking water at this time and as they grow, the pen will get bigger until it is about double the size. I will also start removing a puppy pad at a time until they are only using one. I do not believe puppies should be confined to small areas throughout their time with us. I purchased a puppy and brought her home at 10 weeks and was surprised she didn't know how to run. That is because she was in a pack n play the entire time with no room to run. ​I promised myself, if I was going to raise these puppies I would always make sure they had room to grow, play, and run!! Our Puppy Room is big enough to fit large pens for two litters. Qiena and Qissy are sisters and they had their first litters at the same time. They are sharing the puppy room and you can see they have plenty of room in each pen.